Jon's Guide Service is proud of the on river schools and classes offered. Have you been thinking about learning how to fly fish, or wanting to improve on what you do know? 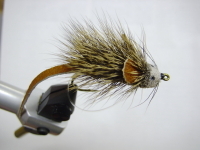 Let Jon Kestner of Jon's Guide Service help you to learn the sport of flyfishing. FFF certified, Orvis certified instructor, and river guide of 23 years, has built a large knowledge base of fly fishing, and how to catch fish. Let our experience help you to become a good flyfisherman. Our schools are on the river or lake and provide a classroom like no other. 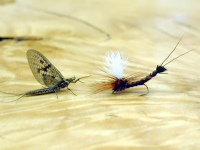 Emergence Cycles (cripples, floating nymphs, diving caddis, spinners, emergence) and How to Fish them. Trout - Instruction on how to become a better Trout fisherman. Steelhead - How to fish for Steelhead (streamers, indicator, dift). Salmon - How to fly fish for Salmon (streamers, drift, surf). Bass - Smallmouth on Grand Traverse Bay, how to on fly fishing. 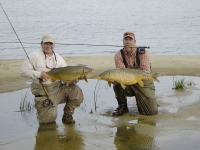 Carp - Smallmouth on Grand Traverse Bay, how to on fly fishing. Pike - Need help on the how to fly fish? Flats & Offshore - Going on a trip and need a class? Casting - How to cast. Fishing - Let's go fishing on the river. Exploration of the Resource - What makes a stream, and whats in it? Knots - Putting it together (leader to fly). Wading - How to get around the river. Catch & Release - How to take what you need and put the rest back for the future.